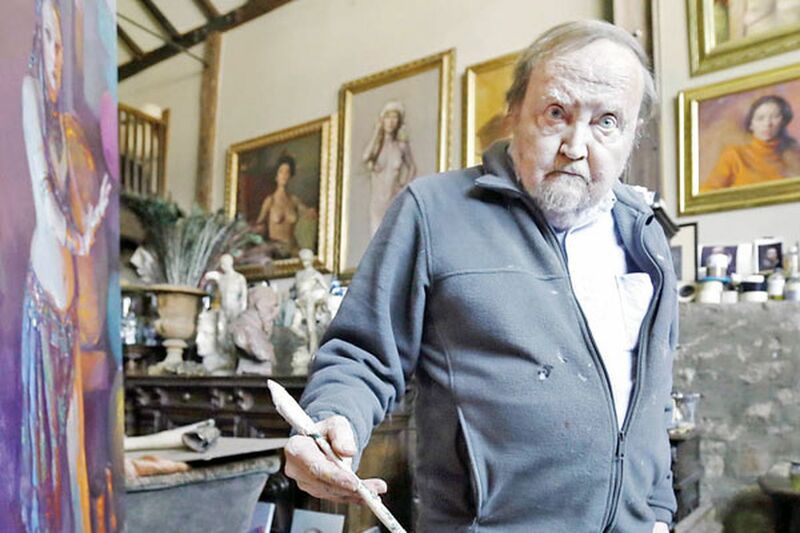 RENOWNED Bucks County portrait artist Nelson Shanks has painted everyone from Princess Diana to President Bill Clinton and from Pope John Paul II to Marisa Tomei. He and his wife, Leona, are the founders of Studio Incamminati, an art school on 12th Street near Callowhill. On a recent Friday, as the north light of a chilly afternoon flooded his Andalusia studio, Shanks, 77, chain smoked cigarettes and drank Diet Cokes while painting Gabrielle, a beautiful young belly dancer, on a 7-by-5-foot canvas. Following his 7-hour session with Gabrielle, Shanks spoke with Stephanie Farr about a hidden secret in his portrait of President Clinton and his friendship with Princess Di, and shared some deep thoughts on celebrity and art. Q: Do you remember the first painting you did as a child? My father went off to war and he had bought an oil painting kit. Somehow, I got a hold of this thing. So I set myself up in the dining room, in this little house on Seneca Avenue in White Plains, at age 5. My aunt was working in Los Alamos. She sent a picture of an adobe house and it had the poles sticking out and the poles were casting shadows in a diagonal. So I sat down and I painted that. I remember being more intrigued, not about painting an adobe house, but in capturing the way those shadows worked. Q: Was there anybody who made you nervous painting them? No. There are plenty of them I've made nervous. Especially Clinton. Oh, he was petrified. If you look at the left-hand side of it there's a mantel in the Oval Office and I put a shadow coming into the painting and it does two things. It actually literally represents a shadow from a blue dress that I had on a mannequin, that I had there while I was painting it, but not when he was there. It is also a bit of a metaphor in that it represents a shadow on the office he held, or on him. Q: Is there a subject that moved you the most while you were painting him or her? When I painted Diana it was at a time when Charles was being mean, the English press was being sadistic and, of course, fate placed me in a situation where I was her protector, close friend and someone who was trustworthy when she couldn't trust anybody. We just became super friends and in a stressful, difficult situation. And remained so until she died. In that painting I'm very conscious of trying to paint a moment in history. So she was sad, heartbroken, introspective, all kinds of things. Not always, but that was definitely a key factor. As that's what was part of history going on, that's what I painted. Q: Was there a painting you remember seeing that invoked a lot of emotion in you? When I was trying to make the decision to leave university and go to art school, needless to say it was a deeply emotional time for me. I walked into the Nelson-Atkins [Museum of Art] in Kansas City and there's a portrait there of his son Titus by Rembrandt. I stood in front of it realizing- I was completely taken with the notion - that I was looking at exactly what Rembrandt looked at and feeling exactly what Rembrandt felt. It was and still is, when I think about it, kind of profound that he could shift me through space and time into the strength of that reality, the power of that reality. Q: If you could have any artist living or dead paint your portrait, who would it be? Someone really, really fast. Because I want to get about my own work. Q: What's your favorite compliment you've ever received about your work? No question about it. When they were unveiling the portrait of Margaret Thatcher, Margaret said "Nelson is not only a painter, he's a philosopher." And that just did it for me. That really blew me away. Q: In the age of the selfie, what's the role of the portrait and the portrait artist? To stop and smell the roses, and while that sounds like a silly comment, there's a whole world of meaning and depth behind the rush. And that's what is worth exploring.